Fairfax Shotokan Karate Club is a non-profit organization dedicated to promoting its members and training in the true art of Karate set forth by the great masters of the art that began centuries ago. Our objective is to develop our character by strengthening our physical and spiritual forces. The logo that appears on the patches that go on our FSKC gi uniforms. We adhere to the same high standards and principles set forth by the founder of Shotokan karate, Master Gichin Funakoshi. These guiding principles are Character, Sincerity, Effort, Etiquette, and Self-Control. 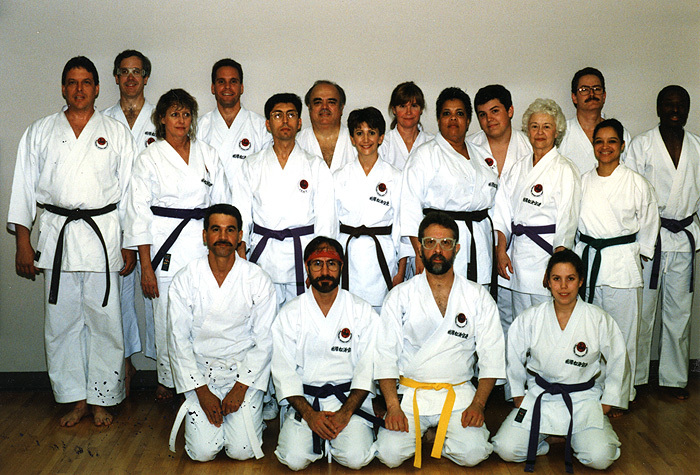 “Fairfax Shotokan Karate Club” was officially established in 1990. However; for many years prior to our official establishment as a club, our students practiced karate at various locations such as recreational facilities, universities, high schools, sports facilities, etc. under no specific name. Around 1990 we decided to become an official karate club, adopted a name (Fairfax Shotokan Karate Club) and joined the reputable International Shotokan Karate Federation (ISKF) under the leadership of Master Teruyuki Okazaki, 10th Dan. Our club started off with a hand full of serious and dedicated karate students at the Fairfax County Government Center located in Fairfax, Virginia. Today the Fairfax County Government Center dojo remains the headquarters of Fairfax Shotokan Karate Cub with additional dojo locations at Tyson’s Sport and Health Club in McLean, Virginia and the World Bank in Washington DC. Since our official establishment in 1990, hundreds of karate practitioners reached the rank of black belt and a majority of them have continued training with Fairfax Shotokan Karate Club today.